Anyone else feel like eating healthier now that the holidays are over? I definitely do! After all the decadent treats I’ve had the past couple weeks, all I want is to eat light. Tonight I was in the mood for a salad. I’m not a fan of the typical lettuce salads that a lot of people make. They’re so boring! So instead I decided to make one that I would actually enjoy eating and look forward to. 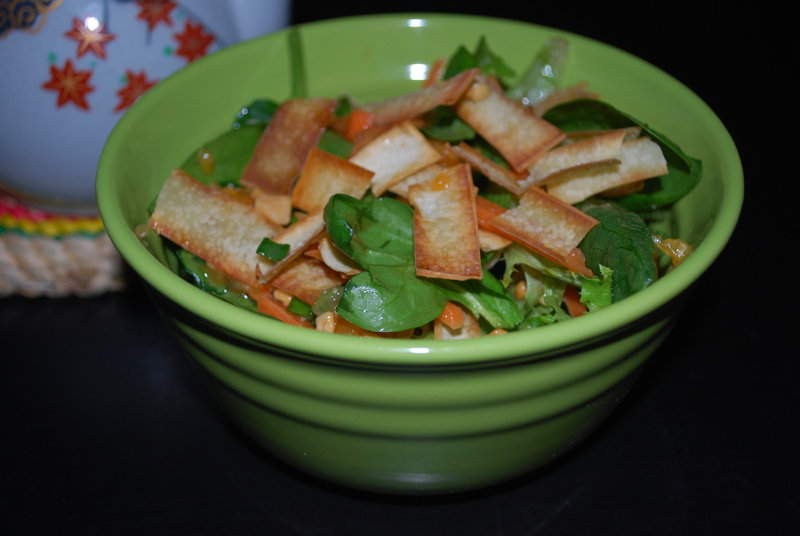 You are going to LOVE this Asian Crunch Salad. It is definitely not boring! 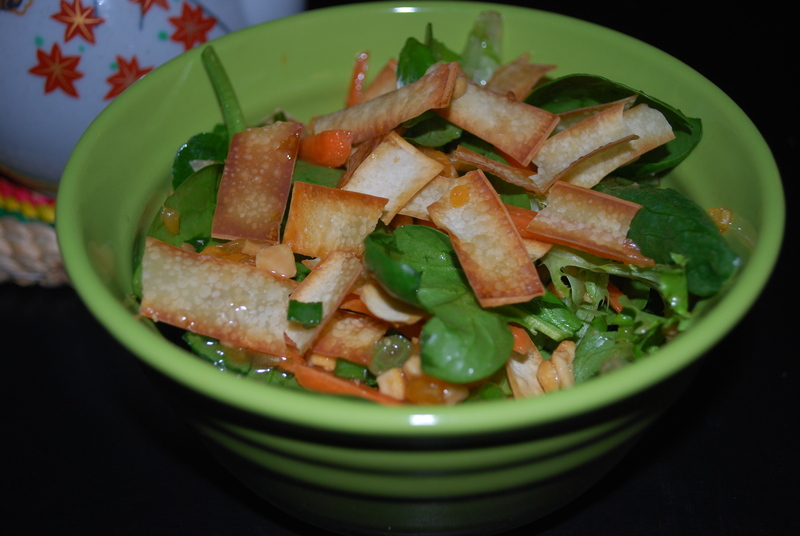 Mixed greens, peanuts, green onions, carrots, mandarin oranges, and crispy wonton wrappers make up this tasty, light salad. There are so many different textures and tastes that make it truly wonderful and unique! 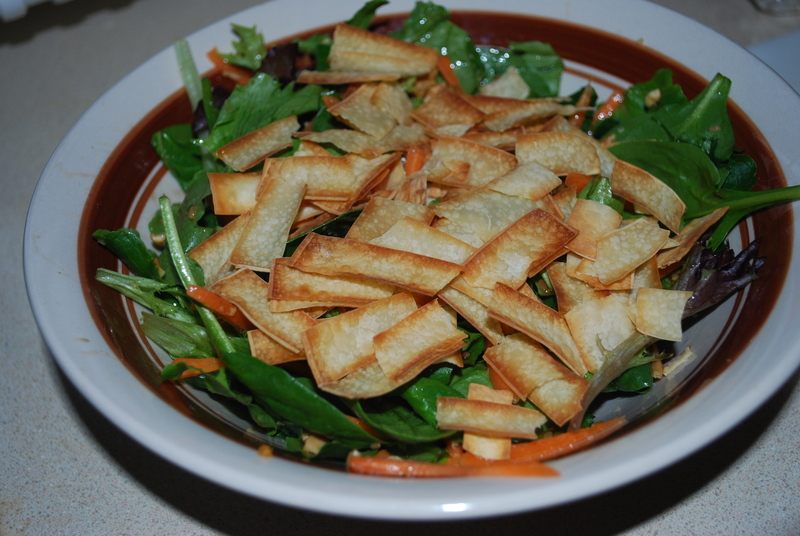 Start with my favorite part of the salad: the crispy wontons. Preheat your oven to 375. Lay out 5 wonton wrappers on a cutting board and slice them into 1/4 inch strips. Line a baking sheet with foil then spray it with non-stick spray. Place the wontons on the baking sheet then bake for 5-8 minutes or until golden. Take them out of the oven and set them aside. 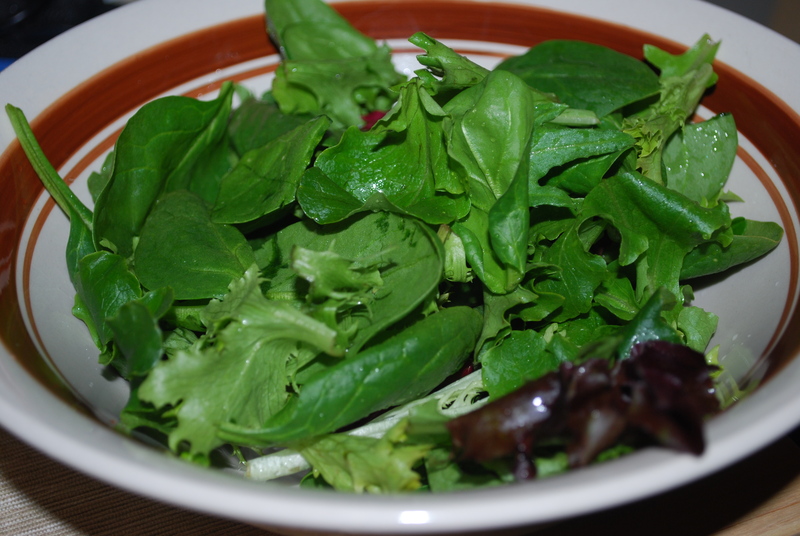 Next wash 2 ounces of the mixed greens of your choice (I used 50/50 mixed greens and baby spinach) and place into a bowl. Add in 1/4 cup shredded carrots. Thinly slice 1 green onion and add to the salad. 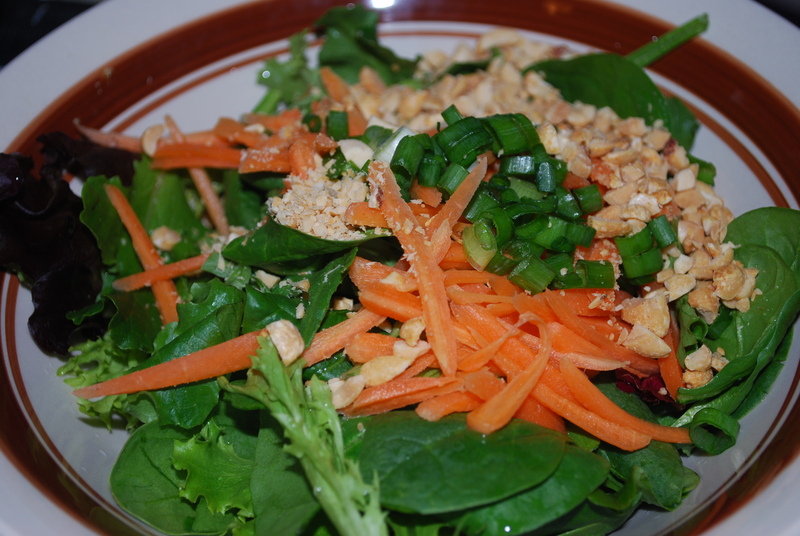 Chop 1/4 cup roasted peanuts and add to the salad. 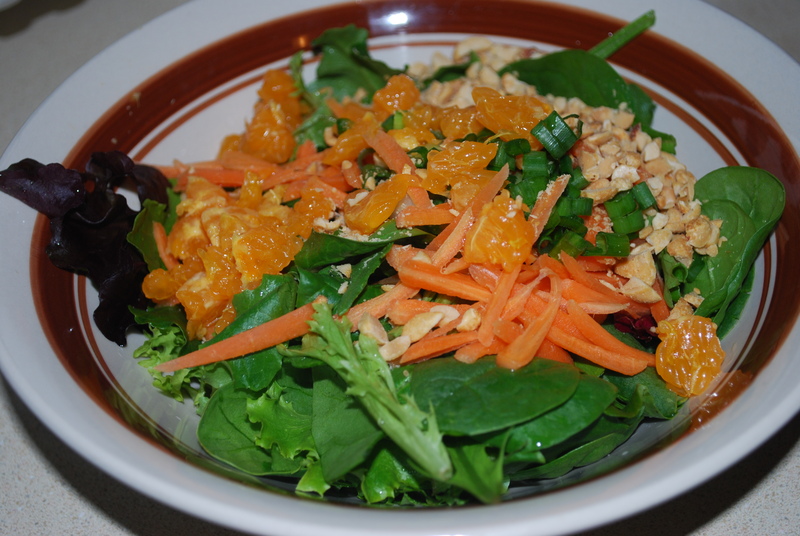 Peel one mandarin orange, remove the membrane, and slice into chunks then add to the salad. 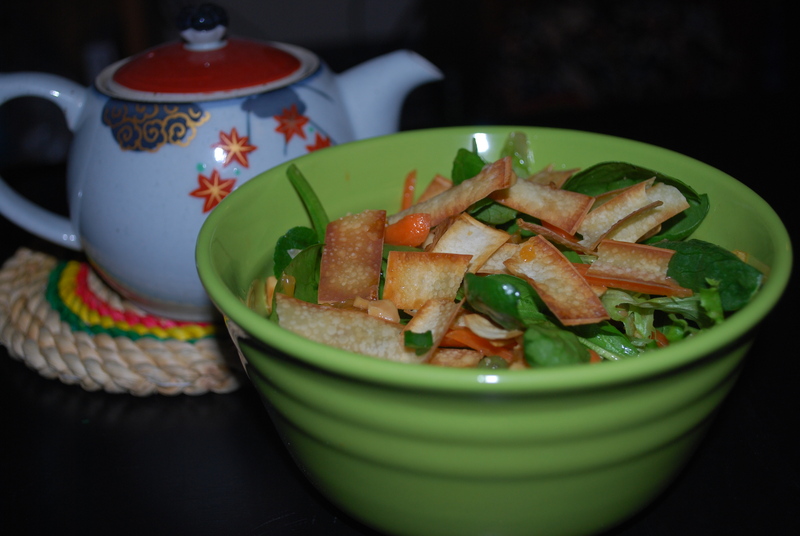 Finally, add your crispy wontons to the top. 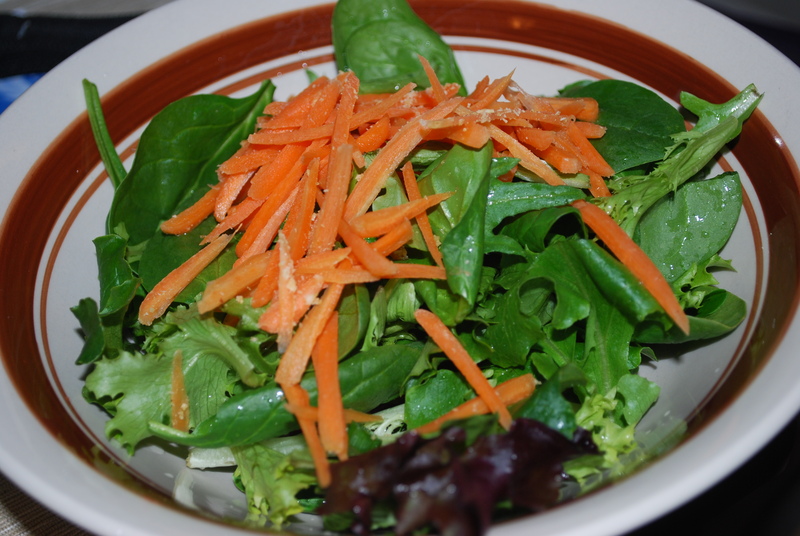 Toss salad with the dressing of your choice. 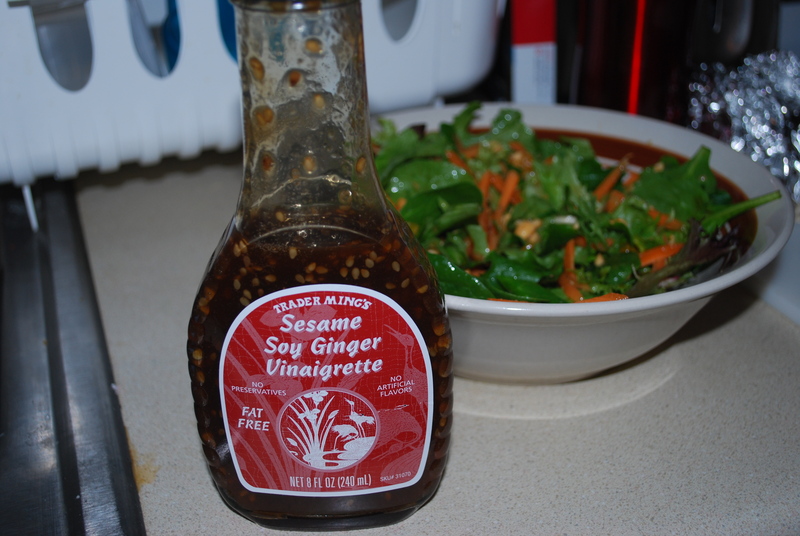 I used Trader Joe’s Sesame Soy Ginger Vinaigrette and it worked perfectly. 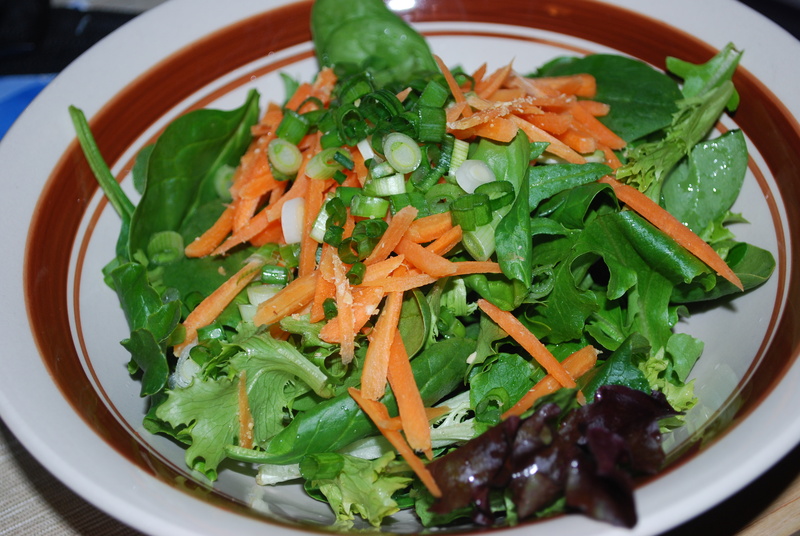 I love this salad dressing – it’s my favorite! Any peanut or Asian-themed dressing would be really good though. Preheat oven to 375. 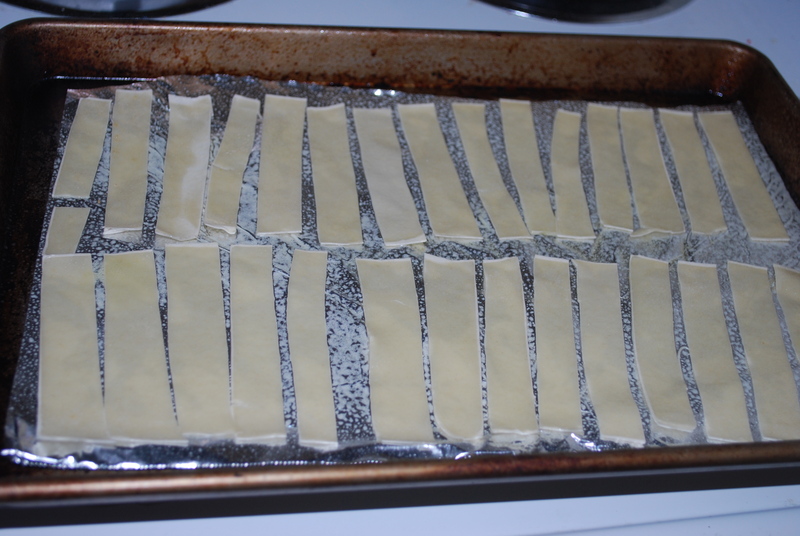 Place wonton wrappers on cutting board and slice in 1/4 inch-thick strips. 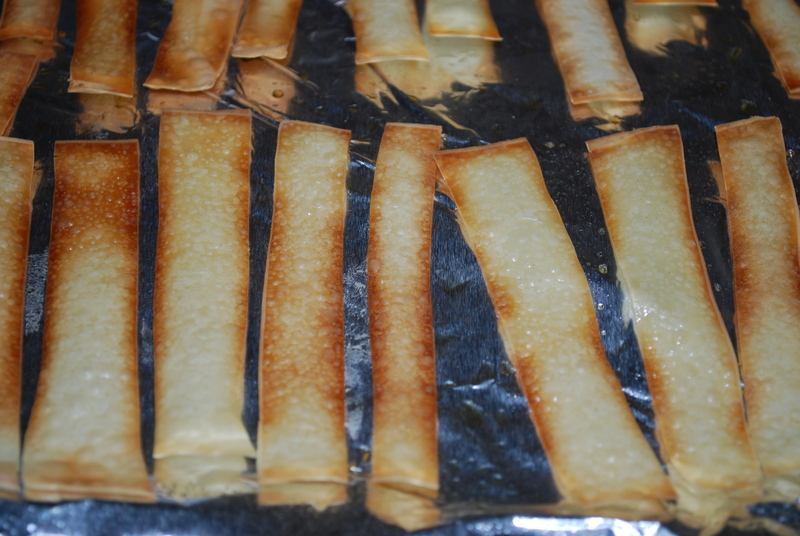 Line baking sheet with foil, spray with non-stick spray, and place sliced wonton wrappers on the sheet. 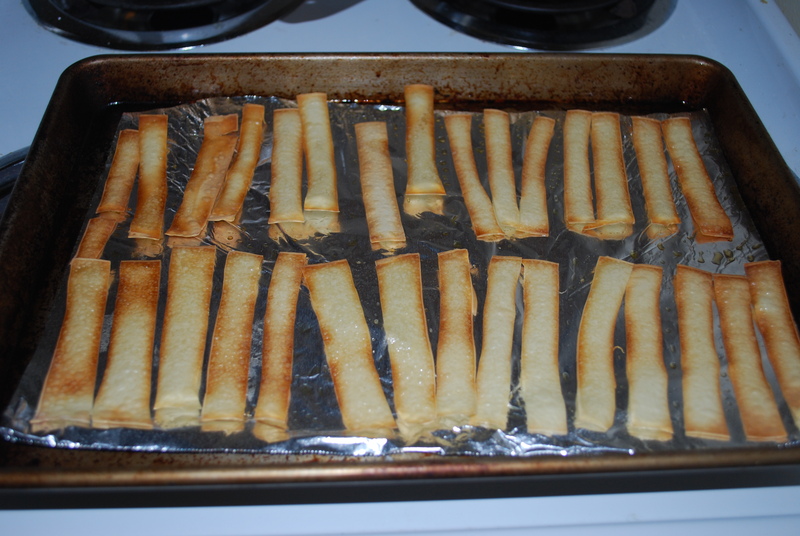 Spray the tops of them with non-stick spray and bake for 5-8 minutes or until golden. Remove from the oven and set aside. 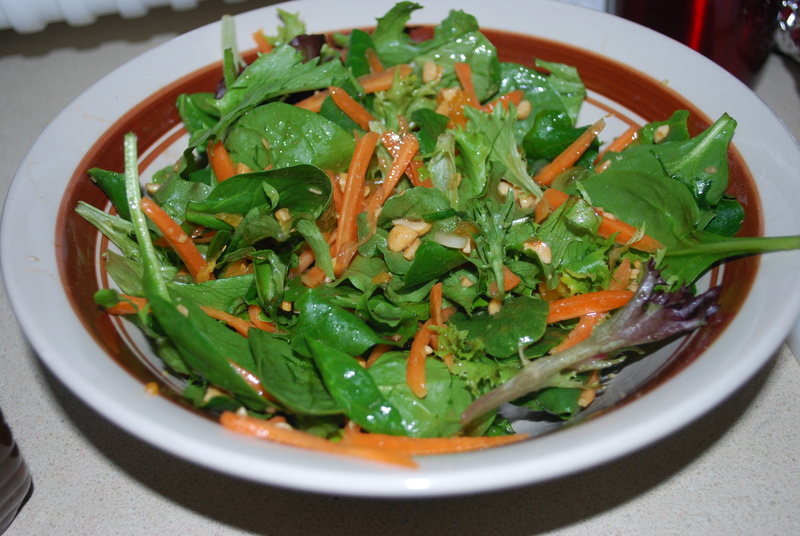 In a large bowl, add mixed greens, carrots, green onion, peanuts, and mandarin chunks. 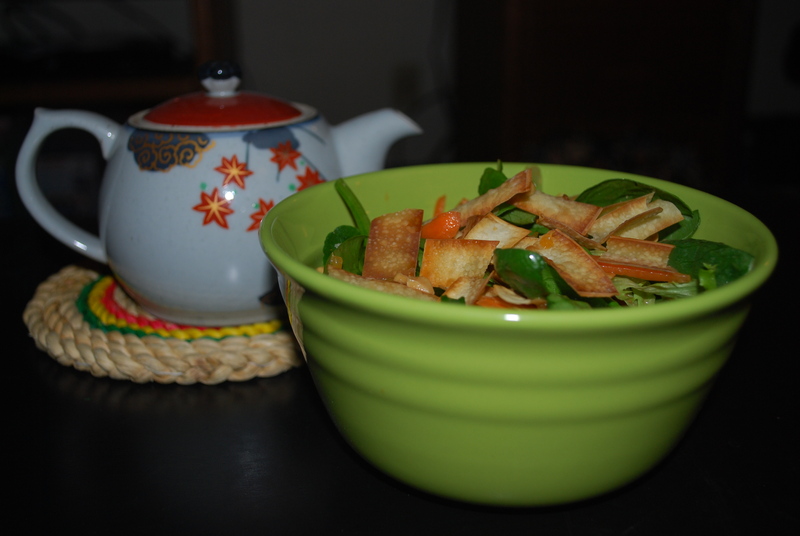 Top with crispy wonton slices. Add in dressing then toss salad to coat. I. Love. This. Salad. I will for sure be making it again! Light, fresh, and delicious! 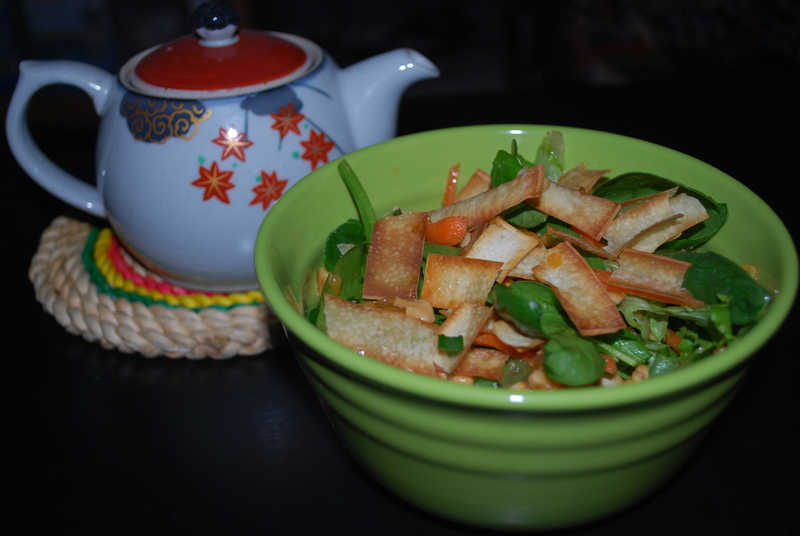 This entry was posted in Asian Inspired Food, Dinner, Healthy, Lunch, Salad, Sides and tagged Asian, crispy, healthy, mandarin oranges, peanuts, salad, wontons. Bookmark the permalink. That looks super fantastic. Will make it! When I do I have some home made garlic powder form home grown garlic. I will try it in the wonton step before I put it in the oven. Thanks Evy! I like the garlic powder idea.